Inder Loves Folk Art: Commence Birthday Preparations for Maggie! This past weekend, it struck me that Maggie's second birthday (which is July 9th) is coming up fast and it was time to start sewing for it! 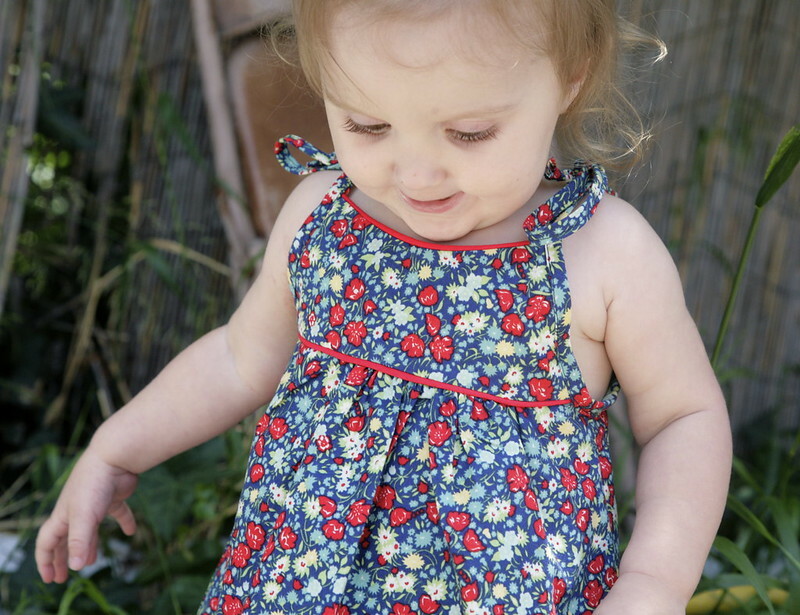 First up was a pretty birthday dress using a pattern loaned to me by my aunt, who sewed for her little girls (my cousins) and is now making pretty things for her grand-daughters. Isn't this pattern darling? I actually pinned this on Pinterest a while back - I was immediately drawn to the classic shape and little ties at the shoulders. Turns out my auntie saw my pin and had that exact pattern! So she sent it to me! (See, using Pinterest pays!) Since it's a size 1, I knew I had to make it up this summer, as it might not fit Maggie next year. I chose this adorable navy floral from Bonnie and Camille's "April Showers" line after seeing my Facebook friend and good sewing buddy Mahriam use it in her amazing patchwork projects. Isn't it sweet? It's classic and pretty but the colors are so vibrant; perfect for my brown-eyed girl. I wavered a little bit about whether to use white or red piping (note that I did not waver about whether to add piping! that was a no-brainer), and I am so happy with my choice of red. It really pops! I love it! I also added some white eyelet to the bottom ruffle as in View 3 of the pattern, which looks so sweet. Of course, being piping-crazy, I did wonder if I should have piped above the lace as well ... piping is a serious addiction, folks! I made only two modifications to the pattern - (1) I lengthened the skirt by 2-3 inches. Maggie is smaller than most two-year-olds, but taller than most one-year-olds, and these older patterns often run very short, as in Shirley Temple short. (2) I applied the shoulder ties as double fold bias tape and used my machine to finish them, rather than following the instructions, which have you fold the bias strip in half, sew it right sides together to the arm hole, and then hand stitch the entire length of ties closed. Not only did that seem extremely time consuming, but the extra layer of fabric would add a lot of extra bulk. After machine sewing my straps, I just cut the ends of the straps and knotted them - since they are cut on the bias they won't fray. I ended up loving this dress even more than I first anticipated! 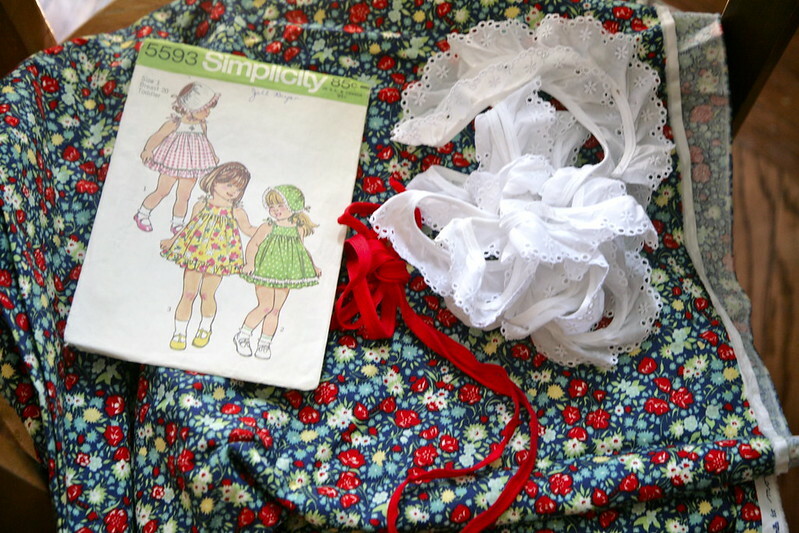 Although it does require a whole lot of gathering (the ruffle as well as the skirt), it is an easy sew. It has no buttons or zippers or fastenings, but it is not shapeless or sack-like thanks to the adorable and sweetly cut yoke. And what could be cuter than those tied shoulder straps? (Although I must say, Maggie enjoys untying those straps and taking the dress off every five seconds, so I might have to sew them closed!) It just seems like the quintessential little girl's summer dress. I liked this dress so much I did something that I rarely do, and cut out a second dress right away. This time in gray seersucker with emerald green piping and shoulder straps. I also want to make a top, which I think I can do just by keeping the length short and omitting the ruffle. So you haven't seen the last of this pattern yet! In other birthday sewing news, I had a very special Waldorf doll custom-made for Maggie (I worked with a wonderful Etsy vender to make the doll - one day I would love to learn to make Waldorf dolls, but sometimes it's best to outsource), with brown eyes and honey-blonde hair. My plan is to buy a little Ikea doll bed for her, paint it, and make bedding for it, since Joe and Maggie's favorite game these days is to put all of the animals and dolls to bed (with bedtime stories and everything!) over and over all day. So I started a doll quilt for dolly, using some beautiful feed sack scraps I got from a buddy. Here it is a few days ago sandwiched and ready to quilt, and I am almost done hand quilting it (very simply) already! So I will be back with more on the Maggie birthday sewing (and painting) front soon! 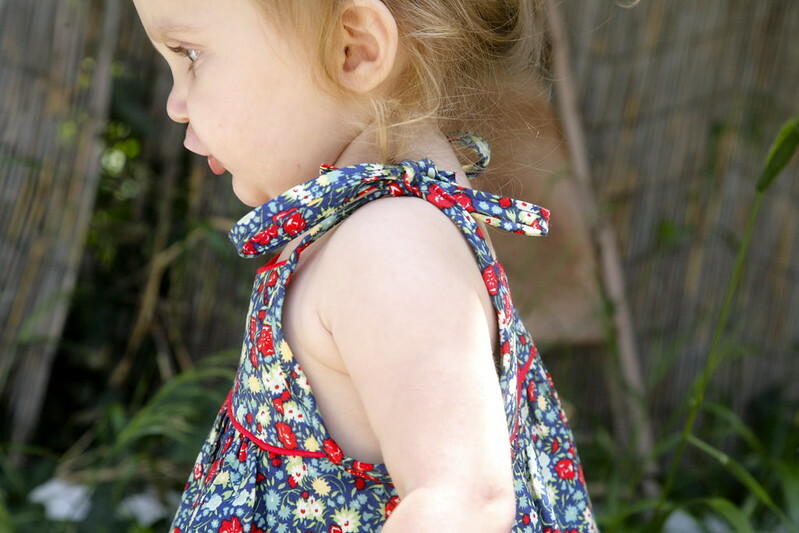 Oh, Inder, I can't believe Maggie is almost two! I can vividly remember her on the quilt wearing the shirt with the number of months old she was on it. She is just so cute! And I can see why you love the dress. It's darling. I love the fabric you chose for it, too. It works so beautifully. Oh and I made my kids a Waldorf doll several Christmas' ago and I think I still have the pattern. If I find it, I'll send it to you with your maternity patterns. I believe it's out of print now. I don't think I'm going to get around to self-sewing this pregnancy. I didn't feel confident enough in my choice of knits to take the plunge. So I will definitely mail them back to you. 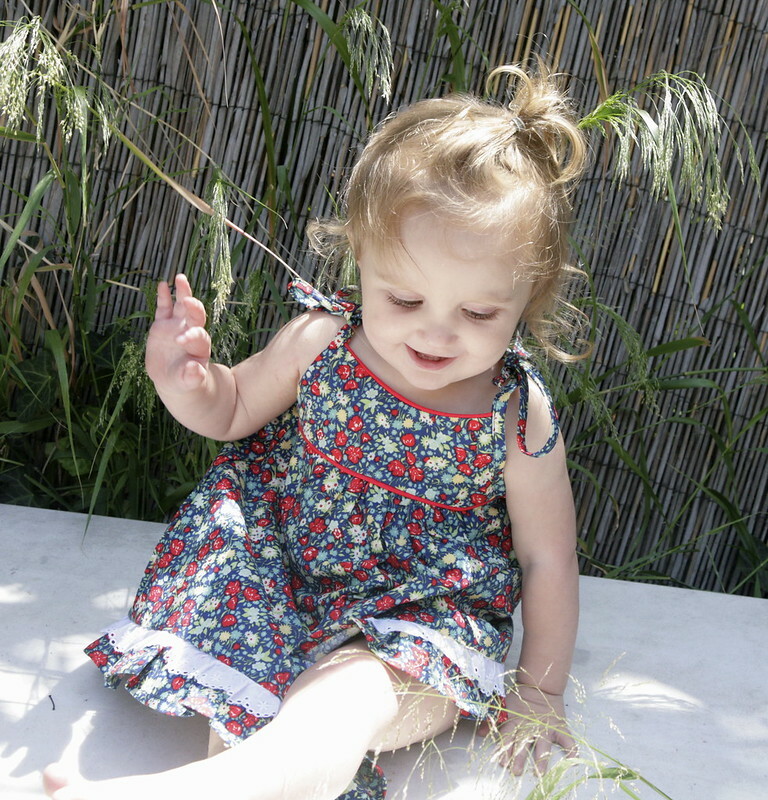 that is the sweetest little dress! the fabric is just perfect, as is the piping, obviously :) and you have her birthday dress finished 3 weeks before her birthday?? now that is impressive! What a lovely dress! Perfect for summer. 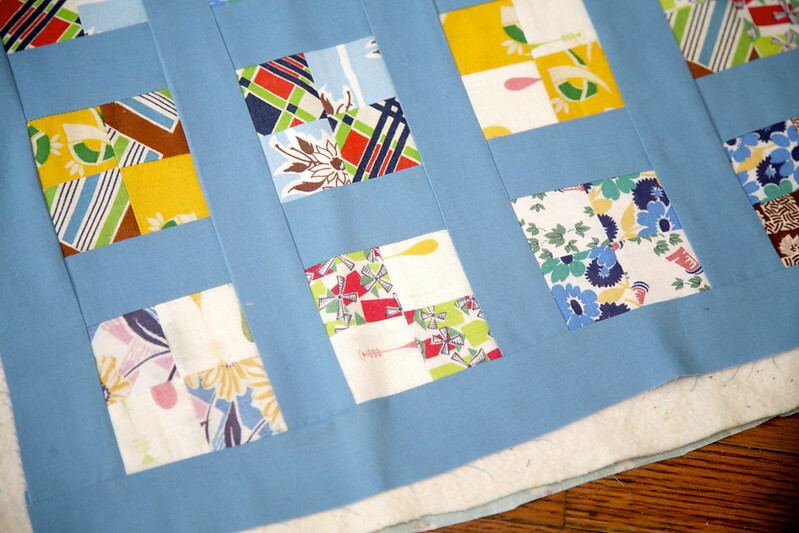 Look forward to seeing the other versions and that sweet little quilt! adorable dress! what a perfect pattern and fabric!! !